Homemade 5 ingredient peanut butter cookies, sandwiched with ice cream, and dipped in chocolate. YUM. Not sure there’s a better cookie ice cream sandwich out there. Bonus? 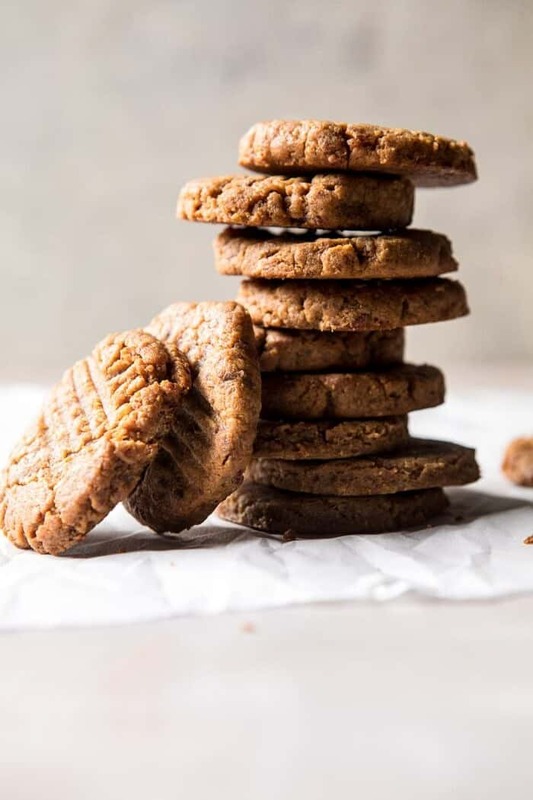 These peanut butter cookies are made with zero added sugar and are also gluten free. 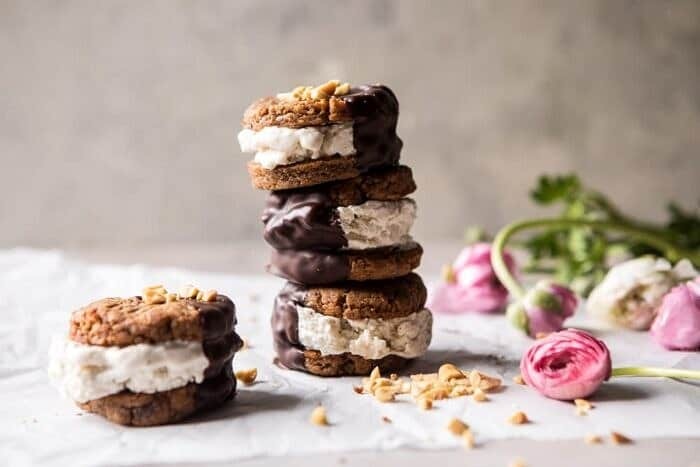 Cookie ice cream sandwiches for all! One of my favorite long weekends of the year is here and I could not think of a better recipe to celebrate with than these ice cream sandwiches. Assuming your weather is warm and sunny, you absolutely have to make these for the long weekend ahead. They are a must. 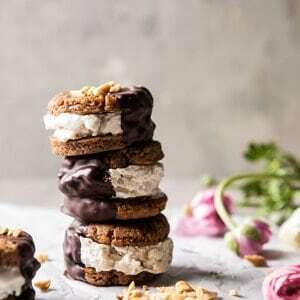 And if your weather isn’t the nicest, I still recommend making these, because let’s be real, ice cream sandwiches are always a good idea. You know? As I type this, I am sitting in my very nice room at the Kimpton Everly Hotel in Hollywood, looking out onto the Hollywood sign, and towards very gray skies. This entire trip to LA has been on the cold and gray side, and of course, the sun is scheduled to come out the minute I leave town. Typical. All is OK though, as I have been pretty busy and really haven’t had time to be outside. I’ll be sharing some details of my trip, including Thursday night’s cookbook signing, in Sunday’s Favorite’s post, so please check back on Sunday! 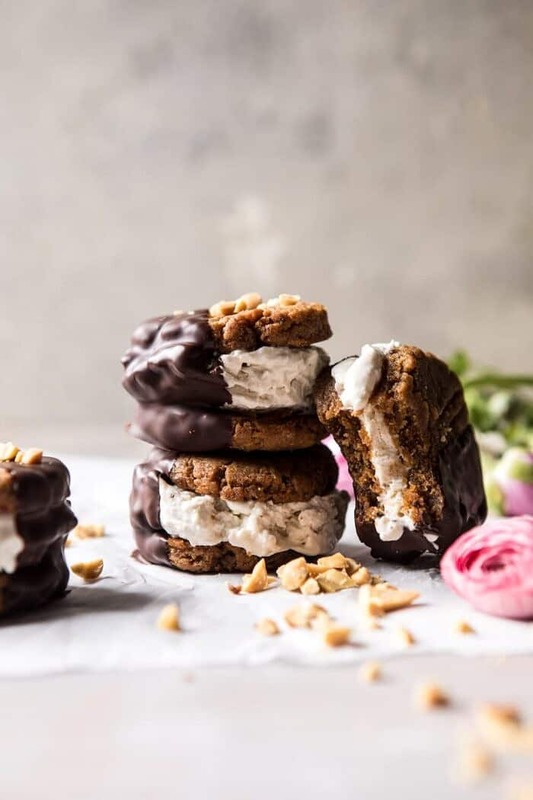 In the meantime, let’s pray for sunshine all weekend long, because as you can guess from these ice cream sandwiches, I am really ready for summertime. How about you? The cookies themselves are actually of the healthier variety, as I used my favorite peanut butter cookie recipe that just happens to be made using all real food ingredients: peanut butter, dates, vanilla, and an egg. See? All real food, and seriously, these are my favorite peanut butter cookies. They’re the BEST. 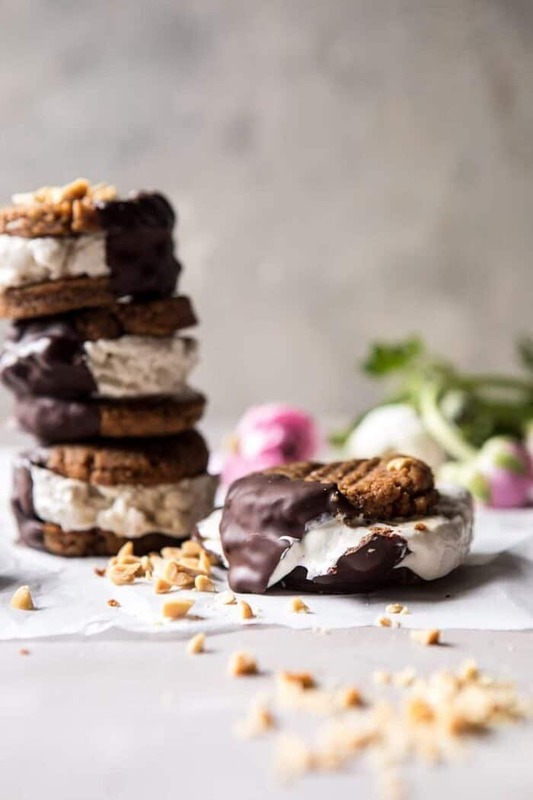 I didn’t set out to make this a healthier dessert, but I love that these sammies just naturally ended up being an ice cream sandwich that we don’t have to feel extra guilty about eating. Very convenient, seeing as we are going into bathing suit season after all! 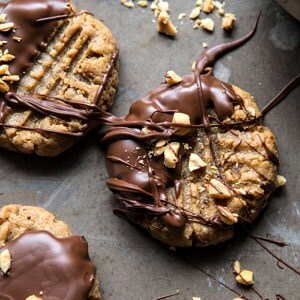 Anyway, these cookies are loaded with peanut butter, baked, sandwiched with vanilla or chocolate ice cream, and then dipped into a little dark chocolate. I mean, nothing crazy, but just so delicious. 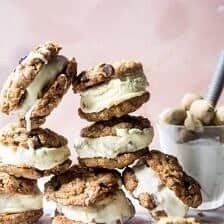 Soft and chewy peanut butter cookies, creamy ice cream, and a chocolate coating? It’s what your Memorial Day weekend needs, and then every other summer day after that. You can either eat the dipped cookies right away or store them in your freezer until you are ready to devour them. I personally love eating the sandwiches right after dipping, as I’ve found them to be the perfect texture and not too hard to bite into. But as long you remove them from the freezer five to ten minutes prior to eating, they should perfect! Oh and one tip here! I recommend keeping the peanut butter cookies on the flatter, thinner side. 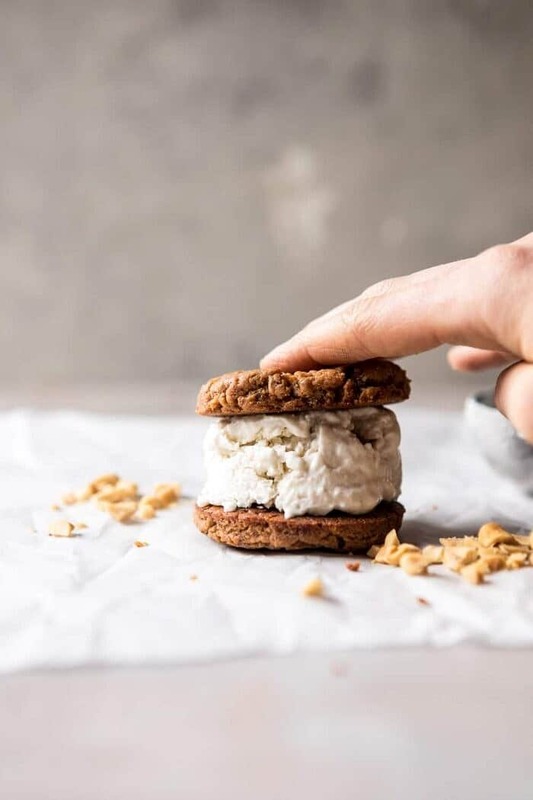 A thick, fatter cookie makes it harder to get your mouth around the sammie. Trust me, I know this from experience. I’d say these are dangerous to have on hand, but then they’re not, because remember, they are healthy…ish. 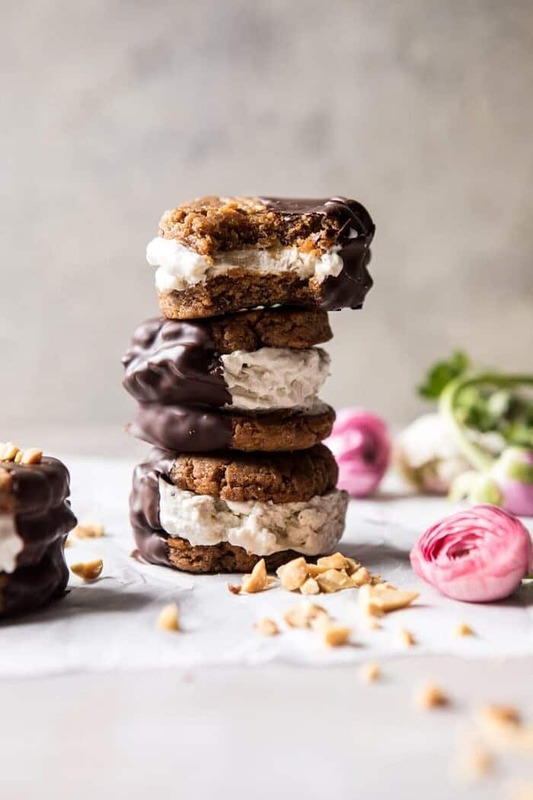 So, I’m thinking ice cream sandwiches every single day of summer from here on out? PS. if you’re looking for other Memorial Day Recipes, be sure to check out my herby potato salad, this yummy grilled zucchini, this spicy corn and burrata, and for sure this easy grilled chicken too. 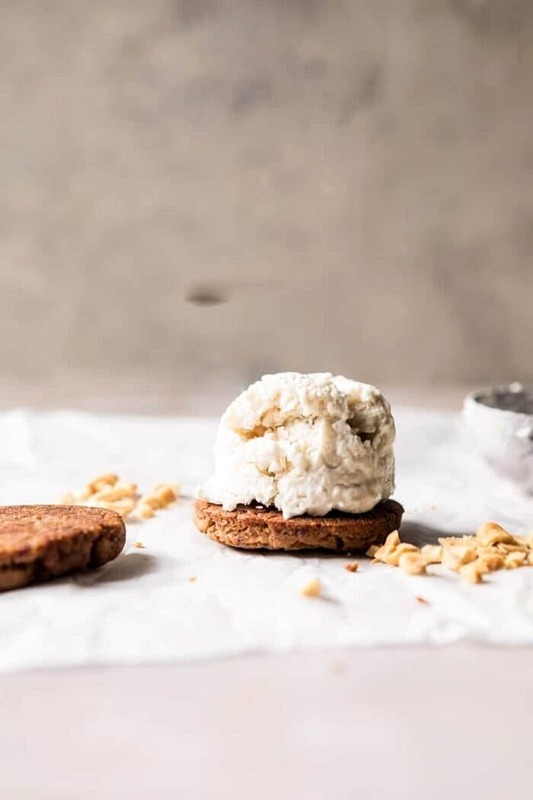 If you make these peanut butter cookie ice cream sandwiches, please be sure to leave a comment and/or give this recipe a rating! I love hearing from you guys and always do my best to respond to each and every one of you. 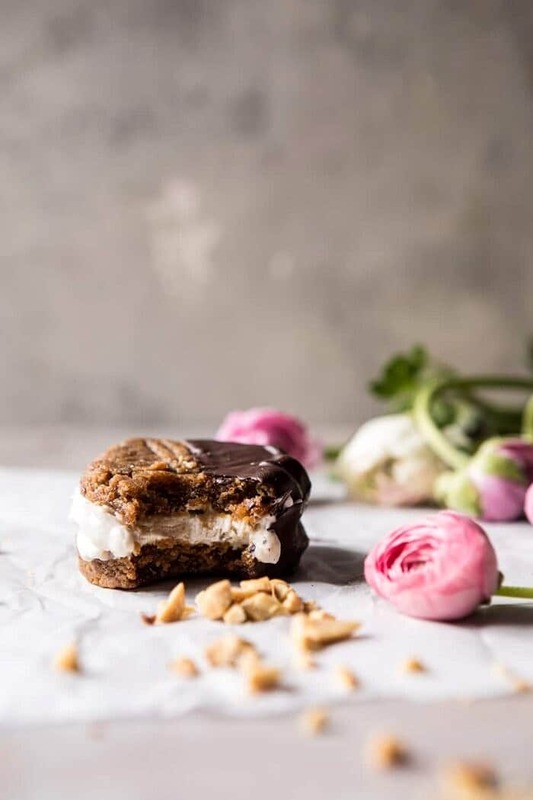 Oh, and of course, if you do make these ice cream sandwiches, don’t forget to also tag me on Instagram so I can see! Looking through the photos of recipes you all have made is my favorite! Homemade 5 ingredient peanut butter cookies, sandwiched with ice cream, and dipped in chocolate. YUM. Not sure there's a better cookie ice cream sandwich out there. Bonus? These peanut butter cookies are made with zero added sugar and are also gluten free. 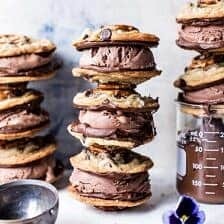 Cookie ice cream sandwiches for all! 2. In the bowl of a food processor, combine the peanut butter, dates, and vanilla. Pulse until well combined and no large chunks of dates remain. Add the egg and pulse to combine. Roll the dough into 16 balls and place on the prepared baking sheet. Using a fork, gently press down on each dough ball to flatten and create a cross hatch pattern. Transfer to the oven and bake for 9-10 minutes. It's important not to over bake these cookies, so set a timer! 3. Remove the cookies from the oven and let cool. Using an ice cream scoop, scoop 1 scoop of ice cream on to half of the cookies. Sandwich with the remaining cookies, gently pushing down. Transfer to the freezer and freeze for 15 minutes. 4. 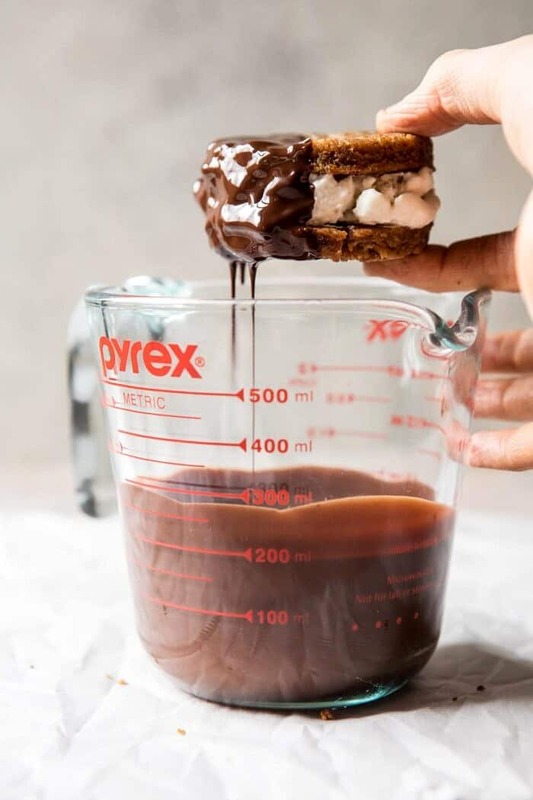 Meanwhile, melt together the chocolate and coconut oil in a microwave safe bowl. 5. 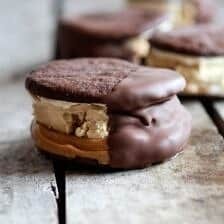 Drizzle or dip the sandwiches in chocolate. The chocolate should begin to harden. Eat and enjoy or return to the freezer. Remove from freezer 5-10 minutes before eating. The perfect way to welcome in summer! 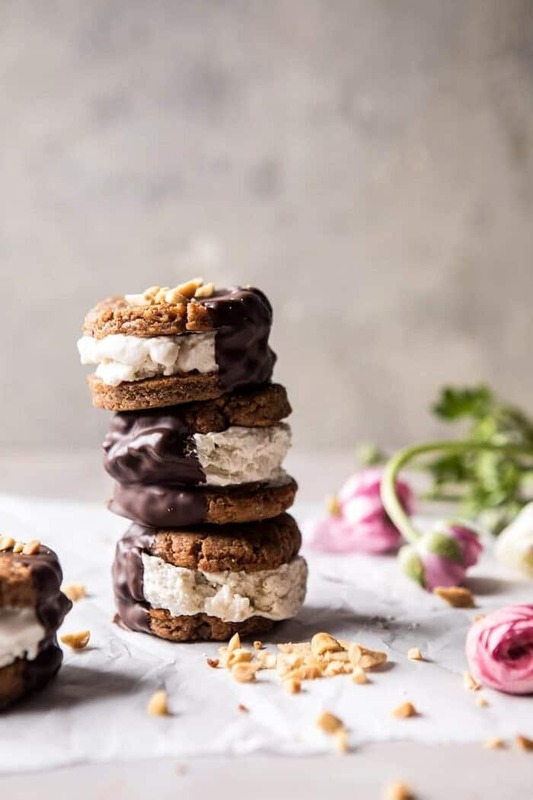 been a while since I had cookie ice cream sandwiches, and although the weather here is not inviting these kinds of treats, I am craving them!!! Hopefully the weather will be warm soon so you can enjoy them! Thanks Ruth! This looks so easy to do and so delicious! These look very initing even as I sit here before breakfast. I could eat one now. Ha!! Yum! What an amazing looking dessert! So ridiculously excited about those cookies! LOVE the fact they are made and sweetened with medjool dates! I am so glad you loved these Lyci! Thank you!! 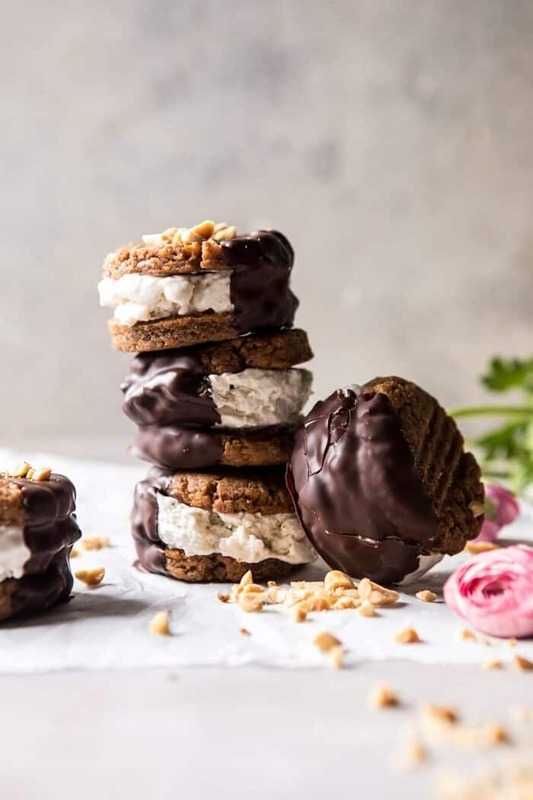 hey girl- these cookie sandwiches look amazing! What a beautiful little dessert! I can imagine how difficult it was to wait for the freeze the cookies for everything to solidify. I definitely wouldn’t mind a little melty action, but then again, who wants sticky fingers? What would be a good plant-based alternative for the egg? Can it be omitted? OH MY GOD!! Visual Show these photos.